Contrary to what you may have heard, eating more fat and fewer carbs can help you lose weight, according to a 2013 study published in the British Journal of Nutrition. But if your usual lunch is filled with sub sandwiches and pizza, you may wonder how you'll make it work when you're limited to meat, chicken, cheese and veggies. With a little creativity, there are a number of tasty combinations you can put together to get you through the mid-day meal and leave you satisfied until your next. Some high-fat, low-carb diet plans call for virtually no carbohydrates -- a cap of 20 grams of net carbs a day. Carb-free lunches may be in order to help stay within that limit. Try a no-carb deli roll. Spread mayonnaise and 1/2 cup of alfalfa sprouts between three to four slices of no-carb deli roast beef -- some deli meat may contain sugar that adds carbs -- and roll into logs for a simple carb-free high-fat lunch. Or, top 1/2 cup of raw spinach with crumbled bacon, 1 ounce of cheddar cheese, sliced hard-cooked egg, red wine vinegar and olive oil. Another high-fat no carb lunch might include mini quiche cups made with whole eggs, heavy cream, blue cheese and chopped bacon whisked together and baked in muffin tins. Even on a strict low-carb diet, you don't have to save your carbs for breakfast and dinner. Eating a few carbs at lunch opens up a larger variety of options. For example, you might make a shrimp and avocado salad with sauteed shrimp, half an avocado, 1/2 cup of cooked broccoli rabe, 1 ounce of whole-fat mozzarella cheese tossed with olive oil and 1 tablespoon of balsamic vinegar. This lunch is high in fat and has only 6 grams of carbs. 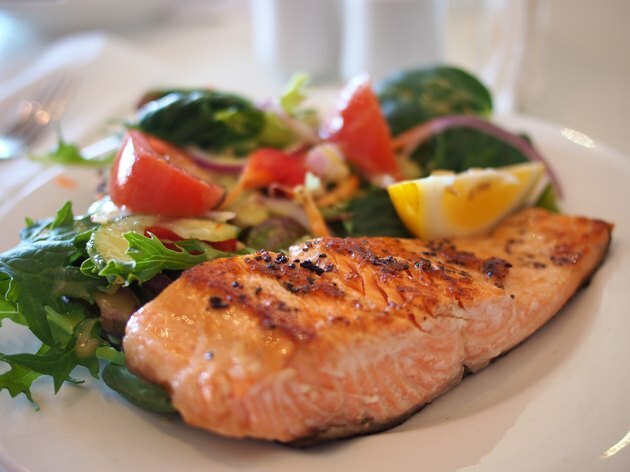 For some healthy fat, enjoy grilled salmon served atop 1 cup of kale cooked in olive oil and tossed with 14 chopped walnuts for 7 grams of carbs. Ricotta cheese is high in fat and low in carbs. Serve 1/2 cup of the cheese with 1/2 cup of sliced cucumbers, 1/2 cup of sliced green peppers and 2 stalks of celery for 10 grams of carbs. There's no set definition for what constitutes a high-fat, low-carb diet, and some plans allow for 50 grams of carbs or more a day. If you're on a higher carb diet, you may be able to fit beans, nuts, seeds and fruit into your lunch. Two cups of lettuce with grilled chicken, 1/4 cup of sliced almonds, 2 tablespoons of sunflower seeds, 1 cup of sliced strawberries, 1 tablespoon of balsamic vinegar and olive oil makes a healthy high-fat salad that tops in at 18 grams of carbs. For a fast bagged lunch with 19 grams of carbs, pack hard-cooked eggs with a small orange, 1/2 cup of edamame, 2 ounces of cheddar cheese and 10 cherry tomatoes with 2 tablespoons of ranch dressing. Or fill a low-carb tortilla with canned tuna mixed with mayo, onions and celery. Serve with a small peach, five green olives and 14 walnuts for a meal that has 18 grams of carbs. Making and taking your own lunch allows you to have more control over the carbs and fat you get. But not having time to plan and prepare a bagged lunch doesn't mean you have to starve. There are a number of meals you can create with restaurant foods. The standard might be a bunless bacon cheeseburger with lettuce and tomato. But there are other options. Chicken wings with ranch dressing and celery, for example, also makes a low-carb, high-fat option. Chinese spare ribs or meat and veggie stir-fries without rice serves well for a high-fat low-carb diet. Ask that your stir-fry be made without cornstarch, or request sauce on the side. Meat fajitas and tacos might also work, as long as you skip the tortilla. Atkins: Love Eating Out? Love This!